List of contributors. Preface. I. Perspectives. 1. The segmental motor system - advances, issues, and possibilities (D.G. Stuart). II. Mechanisms underlying repetitive firing in motoneurons. 2. Repetitive impulse firing in motoneurons: facts and perspectives (D. Kernell). 3. Plateau potentials and their role in regulating motoneural firing (H. Hultborn). 4. Synaptic integration in bistable motoneurons (C.J. Heckman, R.H. Lee). 5. Adapting motoneurons for motor behavior (R. Delgado-Lezama, J. Hounsgaard). III. Input-output functions of motoneurons. 6. Assessing the strengths of motoneuron inputs: different anatomical and physiological approaches compared (P.A. Kirkwood, T.W. Ford, R. Donga, S.A. Saywell, G. Holstege). 7. Models of spike encoding and their use in the interpretation of motor unit recordings in man (R.K. Powers, M.D. Binder). 8. Non-linear summation of synaptic currents on spinal motoneurons: lessons from simulations of the behaviour of anatomically realistic models (P.K. Rose, S. Cushing). 9. Selectivity of presynaptic inhibition: a mechanism for independent control of information flow through individual collaterals of single muscle spindles (P. Rudomin). IV. Properties and central actions of muscle receptors. 10. Why are there three types of intrafusal muscle fibers? (A. Taylor, P.H. Ellaway, R. Durbaba). 11. Quantifying proprioception (A. Prochazka). 12. Movement detection thresholds at the human elbow joint (U. Proske, A.K. Wise, J.E. Gregory). 13. A positive feedback circuit involving muscle spindle secondaries and gamma motoneurons in the cat (E. Jankowska, M.H. Gladden). 14. Neurotrophin-3 and maintenance of muscle afferent function (J.B. Munson, R.D. Johnson, L.M. Mendell). V. Motor unit properties and recruitment. 15. Revisiting the notion of 'motor unit types' (R.E. Burke). 16. Orderly recruitment tested across muscle boundaries (T.C. Cope, A.J. Sokoloff). 17. Limited plasticity of adult motor units conserves recruitment order and rate coding (T. Gordon, N. Tyreman, V.F. Rafuse, J.B. Munson). 18. Motor cortex control of human masticatory muscles (M.A. Nordstrom, T.S. Miles, B.R. Gooden, S.L. Butler, M.C. Ridding, P.D. Thompson). 19. Do lengthening contractions represent a case of reversal in recruitment order? (P. Bawa, K.E. Jones). 20. Motor units of extraocular muscles: recent findings (S.J. Goldberg, M.S. Shall). 21. Neuromuscular strategies underlying ballistic movements (R.J. Callister, E.H. Peterson, A.M. Brichta). VI. Comparative physiology of pattern generators. 22. General principles of rhythmic motor pattern generation derived from invertebrate CPGs (A. Selverston). 23. Central pattern generators and interphyletic awareness (P.S.G. Stein). 24. A brain region in insects that supervises walking (N.J. Strausfeld). 25. Behavior of hindbrain neurons during the transition from rest to evoked locomotion in a newt (I. Bar-Gad, I. Kagan, M.L. Shik). VII. Spinal interneurons and pattern generation. 26. On the cellular bases of vertebrate locomotion (S. Grillner, P. Wallén). 27. The roles of spinal interneurons and motoneurons in the lamprey locomotor network (J.T. Buchanan). 28. Primate spinal interneurons: muscle fields and response properties during voluntary movement (E.E. Fetz, S.I. Perlmutter, Y. Prut, M.A. Maier). 29. Correlations between neurograms and locomotor drive potentials in motoneurons during fictive locomotion: implications for the organization of locomotor commands (T.M. Hamm, T.V. Trank, V.V. Turkin). 30. Failure analysis of stepping in adult spinal cats (R.D. De Leon, N.J.S. London, R.R. Roy, V.R. Edgerton). 31. Locomotor performance and adaptation after partial or complete spinal cord lesions in the cat (S. Rossignol, T. Drew, E. Brustein, W. Jiang). VIII. Mechanical properties of neuromuscular systems. 32. The role of musculoskeletal mechanics in motor coordination (T.R. Nichols, D.C. Lin, C.M.J.I. Huyghues-Despointes). 33. Kinematic redundancy (Z. Hasan, J.S. Thomas). 34. Task-and age-dependent variations in steadiness (R.M. Enoka, R.A. Burnett, A.E. Graves, K.W. Kornatz, D.H. Laidlaw). 35. Mechanical actions of compartments of the cat hamstring muscle, biceps femoris (D.I. Carrasco, A.W. English). 36. What might the brain know about muscles, limbs and spinal circuits? (G.E. Loeb). 37. Animal models of motor systems: cautionary tales from studies of head movement (F.J.R. Richmond, B.D. Corneil, K. Singh). IX. Control of movement studied in man. 38. The sharing principle (J.A. Stephens, L.M. Harrison, M.J. Mayston, L.J. Carr, J. Gibbs). 39. Properties of human peripheral nerves: implications for studies of human motor control (D. Burke, S.C. Gandevia). 40. Rhythmic cortical activity and its relation to neurogenic components of normal and pathological tremors (B.A. Conway, D.M. Halliday, J.R. Rosenberg). 41. Stopping and turning during human walking (R.B. Stein, K. Hase). 42. Disturbances of voluntary movement coordination in stroke: problems of planning or execution? (R. Beer, J. Dewald, Z. Rymer). 43. Group II spindle afferent fibers in humans: their possible role in the reflex control of stance (M. Scieppati, A. Nardone). 44. Indices of cortical motor function following severe brain injury in man (P.H. Ellaway, S.H. Moosavi, M.J. Stokes, M. Catley, N. Haque). Subject Index. In the last decade, we have witnessed a striking maturation of our understanding of how neurons in the spinal cord control muscular activity and movement. Paradoxically, a host of new findings have revealed an unexpected versatility in the behavior of these well-studied neural elements and circuits. In this volume, the world's leading experts review the current state of our knowledge of motor control, outline their latest results and developments, and delineate the seminal unresolved questions in this vibrant field of research. 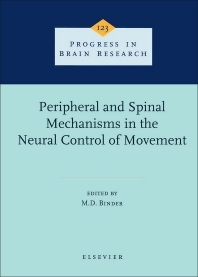 The volume begins with a commentary and overview of our current understanding of the peripheral and spinal basis of motor control. The remainder of the volume is divided into seven sections, each focused on a different problem. The first chapter in each section provides some historical review and presages the experimental findings and hypotheses that are discussed in subsequent chapters. Topics include the biomechanics of neuromuscular systems, the properties of motoneurons and the muscle units they control, spinal interneurons, pattern generating circuits, locomotion, descending control of spinal circuits, comparative physiology of motor systems, and motor systems neurophysiology studied in man. The book serves as a unique reference volume and should be essential reading for anyone interested in motor systems. Moreover, the volume's comprehensive coverage of a wide range of topics make it an effective textbook for graduate level courses in motor control neurobiology, kinesiology, physical therapy, and rehabilitation medicine.